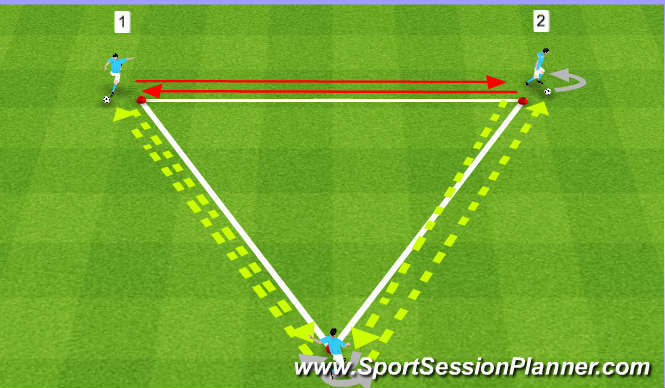 Set Up: Triangle of equal sides of 8-10 yards and two players with a ball. Activity: 1) Player on point of triangle plays lead pass to second player on the outside of the cone. Player receiving ball takes touch to receive towards player passing, plays ball back, and sprints along line to receive ball at other cone and does the same. Repeat for 1 minute, then switch players. 2) Player receiving ball must take touch away into space, perform COD move (Cruyff/Stepover/Stop On), and play ball back from inside the cones. Coaching Points: Good passes that lead player receiving, good first touch to prepare ball, quick movement off ball, player at point getting body in position to receive ball and take it to other side of cone to play ball, quality COD move that sells the fake on second progression.